Peter Schlemihls wundersame Geschichte mitgeteilt von. Hrsg. von Friedrich Baron de la Motte Fouque. 1. Aufl. T. Cadell and W. Davies et al., London 1814 - Five volumes, thick octavo, light spotting to endpapers; contemporary full tan calf, double red and green spine labels; some joints starting, else a handsome set. Handsome 1814 edition of the first and most enduring work of legal writer Richard Burn. The Justice of the Peace and Parish Officer, first published in two volumes in 1755, was quickly recognised as authoritative and remains a classic eighteenth century work. The last and thirtieth edition was published in 1869.The clarity and coherent organisation of Burn's work distinguished it from other manuals: 'Burn ? constructed coherent categories for the discussion of the matters subject to the powers of justices and parish officers; and within each category he presented, in the order in which they arose in the performance of the justice's or officer's duty, the steps a justice or officer would take in dealing with each matter, and the law relevant to each step.' (ODNB)This is an attractive early copy of one of the most important eighteenth-century legal works, and a work, moreover, that was constantly being revised to reflect the latest legal decisions. Corona., Ein Rittergedicht in drei Büchern. London: John Cary 1814. 946 pp, 41 maps coloured in outline plus the environs of london map but lacking yorkshire map, soft brown leather with flap and gilt lettered spine which is worn, book is detached from front cover at spine and has foxing and marks to pages, a bookplate on f.e.p. name in ink dated 1816. . Good. Full Limp Leather. 1814. 8vo..
Baltimore, 1814. 12mo. 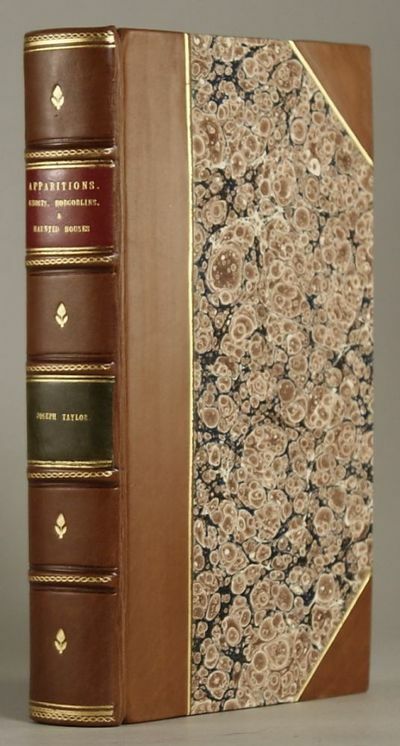 Contemporary speckled calf, leather label, spine gilt. Boards and corners lightly rubbed. Modern bookplate on rear pastedown. Contemporary ownership signature on titlepage. Scattered foxing, toning throughout. Very good. 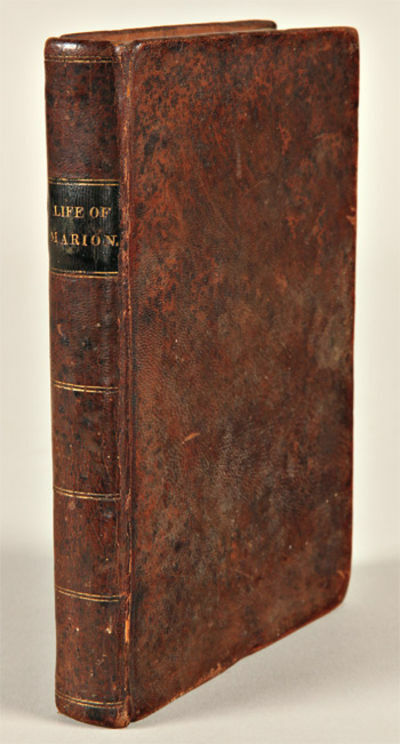 The second edition, almost as hard to come by as the first edition of 1809, of one of the rarest of all southern military books and Revolutionary War accounts, compiled from information supplied by Gen. Peter Horry and written by the famed Parson Mason Weems. General Francis Marion, "The Swamp Fox," was one of the leading American commanders of the Revolution in the South. His brilliant operations in the Carolinas kept thousands of British troops tied down and contributed immensely to an ultimate American victory. Plain and unassuming, he was widely beloved by his contemporaries, and after his death this book instigated his ascent to legendary status. Horry, Marion's second in command for part of the war, supplied many of the facts for the book, although he was allegedly disgusted by Weems' flowery passages and disclaimed any connection with the book. What he disliked, others embraced, and the book went through many editions. All of the early editions are rare. St. Petersburg, 1814. A fine copy. 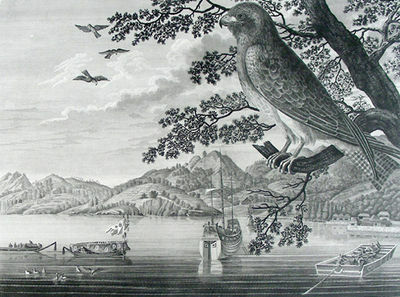 A fine view of coastal Japan in the first decade of the 19th century, showing an American ship, with Nagasaki in the background, and a Japanese Fish Hawk on a branch. This image comes from the atlas of plates to Krusenstern's account of his voyage around the world (published in St. Petersburg in 1810-14). The expedition departed Kronstadt in August 1803 aboard two British vessels purchased for the voyage and, via Cape Horn and visiting the Sandwich Islands, Kamchatka, and Japan, eventually returned to the same port, via the Cape of Good Hope, in August 1806. 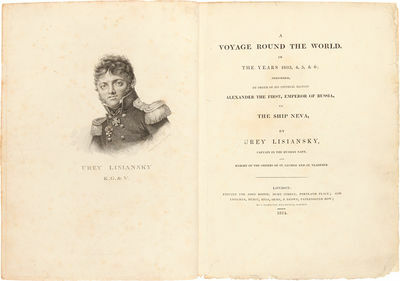 The expedition constituted the first ever Russian voyage around the world, and the published work included much of value, particularly about Japan. The voyage was one of the most important post-Cook Pacific voyages, specifically aimed at obtaining more knowledge of the north Pacific region, establishing diplomatic and commercial relations with Japan, and visiting the Russian trading posts in Alaska and on the west coast of America. It comprised the first Russian expedition to circumnavigate the globe, under the command of Ivan F. von Krusenstern, between 1803 and 1806. The expedition touched on Brazil and rounded Cape Horn, visiting the Marquesas Islands, Hawaii, Kamchatka, and Japan. In Hawaii the expedition separated, with ships under Langsdorff and Lisianski sailing to the Northwest Coast while Krusenstern himself undertook the delicate Japan expedition. He then returned via Macao and the Cape of Good Hope. 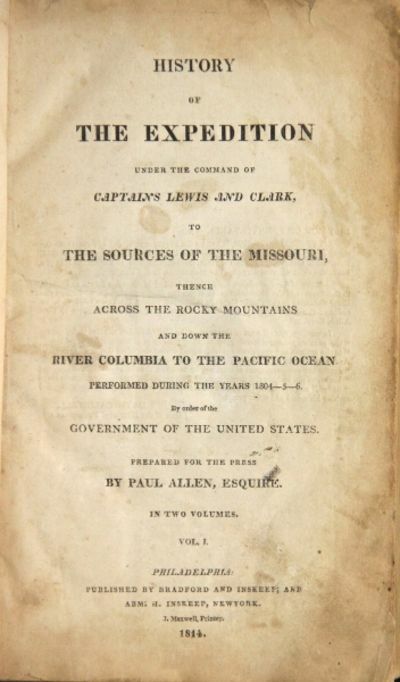 "Lewis, Meriwether, & William Clark"
"History of the expedition under the command of Captains Lewis and Clark, to the sources of the Missouri, thence across the Rocky Mountains and down the river Columbia to the Pacific Ocean, performed during the years 1804-5-6 ? Prepared for the Press by Paul Allen, Esquire." Philadelphia: "Bradford and Inskeep; Abm. H. Inskeep, New York, J. Maxwell, Printer". 1814. "First edition of the first authorized and complete account of the most important western expedition, and arguably the most important book in the field of Western Americana. 8vo, pp. xxviii, 470; ix, , 522; 5 engraved plans and charts, without the large folding map which was not issued in all copies; contemporary full calf neatly rebacked, text foxed, as usual; paper repair and portions of 8 lines of text in facsimile on 2N8 in vol. II; all else very good. London, 1814. Quarto. Modern three-quarter calf and cloth, spine gilt. Portrait lightly foxed. Titlepage and dedication leaf backed with paper; three folding maps backed with linen. A few leaves with minor marginal repairs. Leaves B3 (pp.xiii-xiv) and 3D2 (pp.387-388) extensively repaired, but with no loss of text. Very good and untrimmed, with the bookplate or Sir James Campbell of Ardkinglass on the front pastedown. The first English edition of this very important narrative, which includes an account of Russian expansion into Alaska. Lisianski left the Krusenstern expedition when it reached Hawaii in 1804 and sailed aboard the Neva to Kodiak, where he corroborated reports that Indians had demolished the settlement at Sitka. He then went to Baranov, where he took a new hill, naming it New Archangel. After spending over a year at both Kodiak and Sitka (comprising one hundred pages of the narrative), he set sail for China but hit a reef en route, leading to his discovery of the Hawaiian island which now bears his name. The portion of the narrative which Lisianski devotes to Hawaii is more extensive than that of Krusenstern, and his account of the Marquesas is also different. The final part of the account consists of a detailed description of time spent in Canton. Appendix 3 contains a "Vocabulary of the Languages of the Islands of Cadiack and Oonalaschca...." The colored charts show islands and harbors of the Alaskan coast, most notably the "Island of Cadiack" and "Sitka or Norfolk Sound," as well as a world map. The handsome aquatint views depict "Harbour of St. Paul in the Island of Cadiack" and "Harbour of New Archangel in Sitca of Norfolk Sound." A rare work on Alaska and the Pacific. The last copy at auction, the Frank Streeter copy, sold for $42,000. - Lithographie in 2 Blatt v. Päringer und Merck ( schraff von Schramm ), dat. 1814, je 47 x 71 Seltene Inkunabel der Lithographie. Schefold, bay. Schwaben, Nr. 40199 - 200. Winkler, Frühzeit der deutschen Lithographie, kennt dieses Blatt nicht ( vergl. Joseph Päringer ( = Nr. 604 ). - Der Titel befindet sich rechts oben. Im rechten Rand befindet sich, je Blatt, ein Bibliotheksstempel. Im Plan sind alle Häuser mit Nummern versehen und die Strassen sind benannt. Carte Physique De L'Ile de Teneriffe levée sur les sieux Par Leopold De Buch, en 1814. - Gravé à Paris par Pierre Tardieu, Place de l'Estrapade. N°34, en 1831. - Dessiné par Leopold de Buch. - La lettre gravée par J.D. Lale.':. Washington, 1814. Quarto. Old fold lines. Two small tears in foredge of last two leaves. Minor soiling. Very good plus. In a folio-sized brown half morocco and cloth clamshell case, spine gilt. A superb letter written by Elbridge Gerry to an unidentified recipient discussing his role as presiding officer of the Senate during his term as vice president, written just a few months before the end of his life. Gerry served as President Madison's vice president and staunchly supported Madison's aggression against the British in the War of 1812. The vice president's job, as stated in the Constitution, is to preside over the Senate; most holders of that office, however, had relinquished the post to a president pro tem. In a move that went entirely against tradition, Gerry refused to relinquish his position as presiding officer of the Senate after the close of the session, lest a peace advocate from Virginia take his place. Gerry's letter, which is entirely focused on his work as the presiding officer of the Senate, discusses the issue of "usages" - unwritten rules that governed the Senate in addition to the recorded rules. He was informed by the Senate that they would let him know, as needed, what these usages were and where they were applicable, a practice Gerry refers to near the end of the letter as "a mean snare to entangle the presiding officer." Gerry writes: "I suspect from appearances, there have been anonymous complaints against our friend B.; there certainly have against Mr. [Henry] Dearborn. Your conduct in regard to the former was wise, honorable & friendly; & let the issue be as it may, he never can impute blame to you, & would I think prefer you as a successor, to any other person. This mode of shooting in ambush is savage, & if countenanced, would drive from office every man of honor & substitute in his place an assassin....The attempt to criminate Governor [Return Jonathan] Meigs has failed, & he after an ordeal is confirmed by the Senate [as postmaster general]. In it there is at present such a number of Federalists, & of ostensible Republicans, as to nicely ballance this body on some points, & to preponderate in their favor or others. "The former, in regard to myself, have preserved in general more delicacy than the latter; several of whom, at the moment of my taking the chair, opened a masked battery on it, under the denomination of usages. The written rules & Jefferson's Manual were sent to me by the Secretary before I came to this city, & another set of them was placed on the Senate table. These I applied but was informed of another kind of rule called usages, which were to govern my conduct & that of the Senate. I enquired whether they were in the Journals, or any record, or in print, & was answered in the negative, but that the members knew them & would from time to time give me information. This queer kind of orders was communicated to me from time to time & submitted to the awkward mode adopted by some gentlemen of being thus catechized into the knowledge of their usages; but took the precautions always writing them as stated, & of taking the sense of the Senate, whether they were to be considered as the usages of that body. This record I left on the table for the use of new members, as well as for the government of myself in the last session; during which, one of the members being disposed at a time to dispute the usage, the chair was supported, & Judge Anderson declared, that the President ought to be embarrassed with such kind of rules, but that they ought to be exploded." Gerry then launches into a lengthy and detailed account of an incident involving a dispute in the Senate over usages. He notes that the entire incident was subsequently stricken from the record, likely making this one of the only records of the occurrence: "One of these usages required that each member presenting a petition should not only comply with the written rule by stating the purport of the petition, but should declare that 'it was conceived in respectful terms.' Mr. King soon after my arrival presented a petition, [which] complied with the written rule, & refused to comply with the usage; altho it was read & confirmed by a number of gentlemen who declared it to be correct. Mr. Mason demanded whether the usage was on the journals, & objected to my record of it; but he was corrected by Mr. Dana of Connecticut & others....[Mr. King later] preferred another petition from the city of N. York, complying with the written rule only. I enquired whether it was conceived in respectful terms, he refused to answer, & demanded whether he was in order; saying that if the chair refused to receive the petition, he would take it back, & return it to his constituents with a statement of the facts. In answer, I informed the Senate that the member was in order according to the written rules, but out of order according to the usage; & requested the sense of the Senate, in order to put an end to such unpleasant conflicts on this question, whether not having complied with the usage of the house requiring the declaration mentioned, he was in order? "This produced a warm debate....During the debate, Mr. Giles in an illiberal, & I tho't ungentlemanly manner cast blame on the chair for having in one instance only produced excitement in his feelings by merely enquiring whether a petition which he had preferred, was (agreeably to the requisite of his usage) conceived in respectful terms. He stated that the question had not been presented by any President pro tem, & implied a distrust of the honor of the member. I stated if there existed a distrust, it was not on my part, but on that of the Senate; which had established the usage & made it binding on the members of the Senate, & who made it the duty of the President to apply it as a rule...After the [flame?] had risen, I informed the gentlemen, that they had not supported the Chair in applying their usage, which was here apparently a mean snare to entangle the presiding officer; & that until the usages were ascertained, recorded & determined to be rules of proceeding by the Senate, they would not again by me be applied as such. The next day Mr. Dagget moved to amend the Journal so as that the decision of the Senate should not appear to have been against a usage. I read the motion & informed the Senate that they had a right to put what they pleased in their Journals, over which I had no control; but that the motion did not state the fact, & that this was truly recorded by the Secretary. Another member then moved to strike out the record in regard to this matter & so it ended." Gerry adds in a post script: "The members of the Senate have appeared since this affair attentive, more so than usual. But it develops I think a high degree of party prejudice. I shall bury it however in oblivion, & alter my future proceedings, so as to stand on recorded rules and practices." Gerry served in the Continental Congress and was a signer of the Declaration of Independence. He was an early and vigorous advocate of American Independence, and played a crucial role in the formation of the new United States government, insisting on a bill of rights being added to the new Constitution. "Gerry warned that the Constitution would not be ratified without a bill of rights, and he proved to be right. 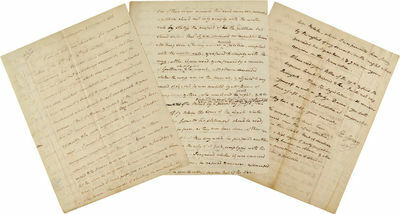 Massachusetts accepted the document, but only with the strong recommendation that a bill of rights be added. Several other states followed suit, and the Constitution was ratified but only with these provisos. Gerry staunchly supported the new government, helped to frame the Bill of Rights, and served as congressman from 1789 to 1793" - ANB. His name is perhaps most remembered, however ignominiously, in connection with the term "gerrymandering." In his second term as governor of Massachusetts, Gerry redrew district lines to consolidate his party's control in the state senate. "The shape of one electoral district on the map resembled a salamander, and one wit promptly dubbed it a 'Gerrymander.' Hence, the term used today when redistricting results in a concentration of the strength of one political party and a weakening of its opponent's strength" - ANB. Though this was not necessarily a new practice, the name stuck. Gerry ran on the ticket with President Madison in 1812, for Madison's second term as president, and died in office in November 1814. An interesting and detailed letter by Gerry, unraveling the intricacies of the rules in the Senate, coupled with the difficulties of handling party politics in that body. Philadelphia: New York, 1814. Contemporary calf, spines gilt, gilt leather labels. Expertly repaired at joints. Very good. In a black morocco box. Provenance: William Jackson, Jr. (signature on title of first volume). The first edition of the "definitive account of the most important exploration of the North American continent" (Wagner-Camp), here including the very rare large folding map. The work is a cornerstone of any collection of Western Americana, including essential information on the geography, natural history, science, and ethnography of the area explored. The book describes the government-backed expedition to explore the newly acquired Louisiana Purchase undertaken from 1804 to 1806 by ascending the Missouri to its source, crossing the Rocky Mountains, and reaching the Pacific Ocean. In total, the expedition covered some 8,000 miles in slightly more than twenty-eight months. They brought back the first reliable information about much of the area they traversed, made contact with the Indian inhabitants as a prelude to the expansion of the fur trade, and advanced by a quantum leap the geographical knowledge of the continent. This official account of the expedition is as much a landmark in Americana as the trip itself. The narrative has been reprinted many times and remains a perennial American bestseller. It is the first great U.S. government expedition, the first book on the Rocky Mountain West, and a host of other firsts. It is among the most famous American books. Philadelphia, 1814. Seventy-six engravings, with excellent handcoloring. Folio. Contemporary marbled boards, expertly backed to original style in red calf with plain gilt rules, title and volumes numbers stamped in gilt. Some light wear to text leaves. Moderate to heavy foxing and offsetting from plates, as usual with this work, but far better than typical. Wilson's work was the most important work on American ornithology before Audubon and the most elaborate color plate book published in America up to its time. Wilson, a Scot, began work on American birds in 1802 with the encouragement of William Bartram. The feverish pace of his work, which began to be published in 1808, weakened his constitution, and he died suddenly in 1813, with the eighth volume in press. His friend George Ord completed the work and wrote a memoir in the final volume. Although incomplete in scope, because of Wilson's narrow geographical travels and his early death, it was by far the most extensive work about American birds. 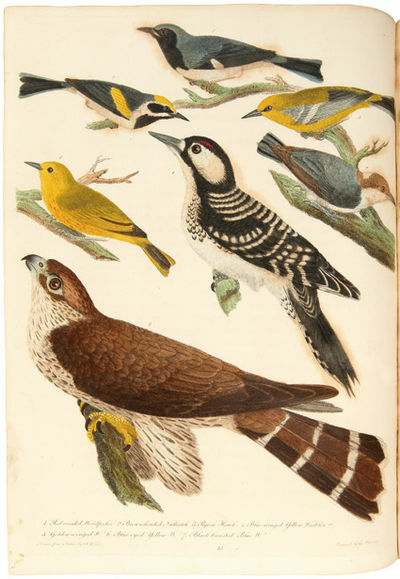 Likewise, the color plates set a new standard of achievement for works produced in America, even though Wilson's artistry was sometimes crude, and the depictions of birds are stiff and out of scale compared to Audubon. In fact, as a self-taught poet and schoolmaster who came late to such work, he did a remarkable job, although he was fated to be outshone by Audubon. 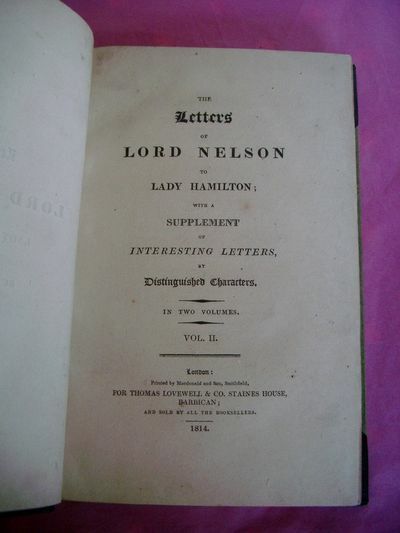 Wilson's first volume appeared in September, 1808; the present set is the second issue, with a different imprint than the first. The second volume came out in 1810, the third and fourth in 1811, the fifth and sixth in 1812, and the seventh and eighth in 1813. Ord produced the final volume in 1814. Wilson's book is a great pioneering effort in both American bookmaking and science. It remained a standard book even after Audubon, and possibly went through more editions than Audubon's octavo set, staying in print in one form or another until the 1880's. Bennett calls it "the first truly outstanding American color plate book of any type.
. Near Fine Condition. 12mo. (4 5/8 x 6 7/8 inches). Treed Calf with ornamental gilt tooling . Author and title in gilt set in second (red) panel. Small scuff to front board otherwise fine. Former owner's signature to ff. Extensive pencil notation on rear paste down, which documents the acquisition in 1920 and subsequent rediscoveries of the treasures contained within by the continuous owner of 40 years. Unpaginated. Title page, advertisement with 42 delicate copperplate engraved maps, hand-colored in outline, with folded engraved map ( 13.75 x 11.75 inches) of 'The Turnpike Roads of Yorkshire' bound in. Plus 4 page catalogue of works published by John Cary. A Delineation of the Turnpike Roads of England and Wales: Showing the immediate Route to every Market and Borough town throughout the Kingdom, Laid down from the best Authorities, on a New Set of County Maps. To which is added, An Alphabetical List of all the Market Towns, with the Days on which they are held. Printed for John Cary, Engraver, and Map-seller, Strand. "Lewis, Meriwether, & William Clark." 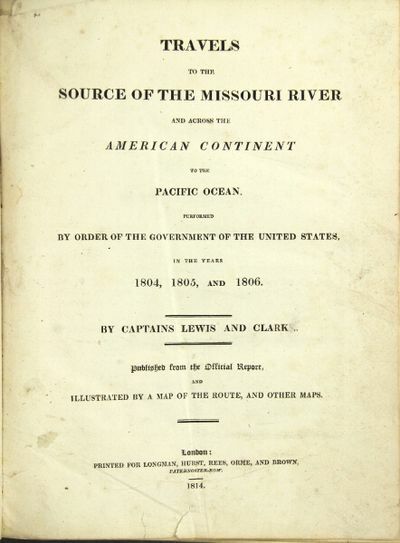 "Travels to the source of the Missouri River and across the American continent to the Pacific Ocean Performed by order of the government of the United States, in the years 1804, 1805, and 1806 By Captains Lewis and Clarke (sic) Published from the official report, and illustrated by a map of the route, and other maps "
London: "printed for Longman, Hurst, Rees, Orme, and Brown". 1814. "First English edition of Lewis and Clark's famous account, 4to, pp. [iii]- xxiv, 663, ; large folding frontispiece map (mounted on linen and laid in), 5 engraved maps on 3 sheets, bound without the half title in contemporary full calf with an early rebacking; small tear at the bottom of the title page, marginal tear in leaf x2 repaired with paper tape in the margin, a number of old pencil annotations in the margin by an early owner, early 20th century photograph of a statue of Sacajawea mounted on a flyleaf, the whole somewhat scuffed and rubbed, otherwise a good, sound copy. Field 929; Graff 2480; Howes L-317; Sabin 40829; Streeter Sale 3128; Wagner-Camp 13:2. La Perse, ou tableau de l'histoire, du gouvernement, de la religion, de la littérature, etc., de cet empire; des moeurs et coutumes des habitants. Ouvrage orné de Gravures, faites d'après des peintures persanes. 4 vols. Stammbuch Liber Amicorum St. Petersburg 1797. Freundschaftsalbum aus St. Petersburg, Berlin, Trebnitz, Stettin. 1797- ca. 1814. - 215 Seiten. Mit 14 überwiegend farbigen, aquarellierten Handzeichnungen, 2 Kupferstichen und 5 lose einliegenden edlen Seidenstoffen. 12 x 18,5 cm, Lederalbum der Zeit mit Goldprägung, Goldschnitt. Umfangreiches Album mit zahlreichen Beiträgern, darunter: DuMont, Albert Eichmann, Johann Friedrich Grünewald, C.H. Emde, Johann Wilhelm Schöllwer, Gustav Weißschuh, Gottfried Titzkow, Johann Friedrich Leonhard Brühwein, Julius Etterol, Johann Gabriel Renz, Johann Georg Friedrich Dallmer u.v.a. Unter den Handzeichnungen eine schöne blattgroße Ansicht von Kronstadt. Die Kupfer zeigen einen Petersburger Stadtplan und die Bibliothek in Berlin. - Album etwas berieben. Gut erhaltenes, reichhaltiges Album. Philadelphia, 1814. Folio. Dbd. Tanned, dampstain in upper margin. Good. In a brown half morocco and cloth box. The rare second edition of "The Star Spangled Banner," the national anthem of the United States, in music form. Here, all four verses of Francis Scott Key's immortal poem are printed on the third page. It is printed with a song originally published in 1811, "The Battle of the Wabash," written to commemorate the Battle of Tippecanoe. That song, as well as "The Star Spangled Banner," were meant to be sung to the tune of "Anacreon in Heaven," also known as the "Anacreontic Ode." This, therefore, is the first appearance of Key's lyrics, together with the music to which it was meant to be sung. As Dichter & Shapiro point out, this printing is also "the only appearance known of Francis Scott Key's immortal song together with the words of the 'Anacreontic Ode.'" The present printing follows only a Baltimore edition by Carrs Music Store, which is believed to have been issued before Nov. 18, 1814, and possibly before October 19 (see Filby & Howard). Francis Scott Key, a Baltimore lawyer, spent the night of Sept. 13-14, 1814, detained on a British ship in Baltimore harbor. That night, Key witnessed the British flotilla bombard Fort McHenry, an American stronghold in the harbor. From the outset of the battle a large American flag could be seen flying over the fort, but by the end the Stars and Stripes was nowhere to be seen. At dawn, the flag was seen once again, showing that Fort McHenry had not been taken by the British, and inspiring Key to write the lyrics that he initially called "Defence of Fort M'Henry." Key meant for the lyrics to be sung to the tune of a popular song of the day, the "Anacreontic Ode," also known as "To Anacreon in Heaven," by British composer John Stafford Smith. Key's lyrics first circulated as a handbill, and on September 20 were printed in a Baltimore newspaper. 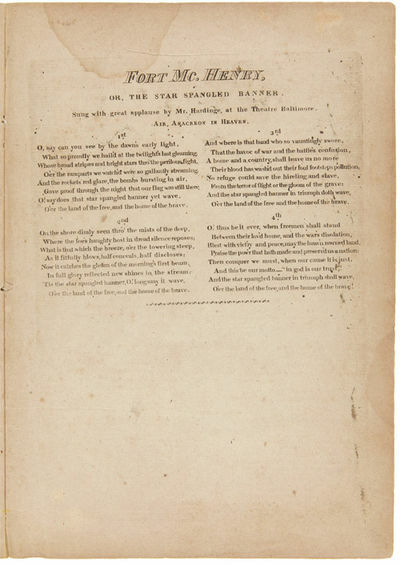 It soon became known as "The Star Spangled Banner," and was performed by Hardinge's theatre troupe in Baltimore on October 18, 1814. As is noted in the title, the song was "sung with great applause by Mr. Hardinge, at the Theatre Baltimore," suggesting that this publication dates to late 1814. Both this Philadelphia printing of "The Star Spangled Banner" and the Baltimore printing that precedes it are very rare. Two copies of the Baltimore printing have appeared at auction since 1967: the Streeter copy, which brought $23,000 in that year, and a copy that sold at Christie's in 2008 for $506,500. In that same time span only one copy of this Philadelphia printing sold at auction, in 2002, when a copy at Christie's brought $15,600. OCLC and Filby & Howard together locate a total of only eleven copies of this Philadelphia printing. A rare and early printing of "The Star Spangled Banner," our national anthem, which stands second only to the flag as a symbol of the nation. Londres: Henry Colburn, 1814. Fine. Henry Colburn, Londres 1814, 13,5x22,5cm, relié. - Second edition of the first book of the author printed after the very rare first edition London 1797. Bound in half tan sheepskin, back with five set with golden friezes nerves decorated with black pinstripes and typographical reasons cold boards marbled paper guards and contreplats of handmade paper, binding romantic pastiche. Rare spots, a small hole with light attack with text pages 387-388. Rare. --- Please note that the translation in english is done automatically, we apologize if the formulas are inaccurate. Contact us for any information! - [FRENCH VERSION FOLLOWS] Deuxième édition du premier ouvrage de l'auteur imprimée après la très rare édition originale de Londres de 1797. Reliure en demi basane fauve, dos à cinq nerfs sertis de frises dorées orné de filets noirs et de motifs typographiques à froid, plats de papier marbré, gardes et contreplats de papier à la cuve, reliure pastiche romantique. Rares rousseurs, un petit trou avec légère atteinte au texte pages 387-388. Rare. Philadelphia: Moses Thomas , 1814. 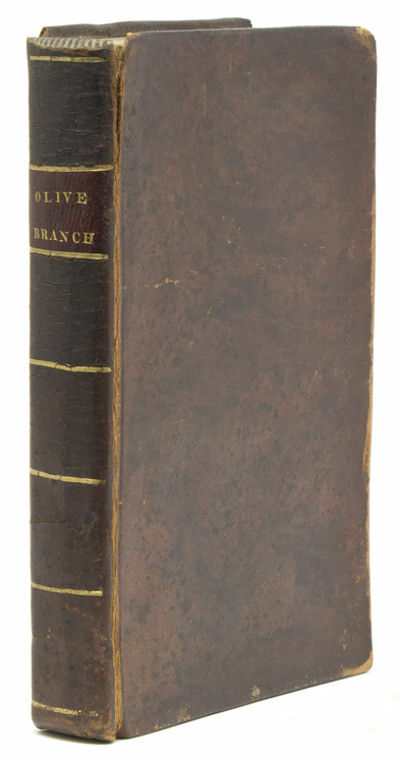 Octavo; crimson leather and marbled paper-covered boards, with titling and decorations stamped in gilt on spine; 524pp, lacking the engraved general title page and four frontispiece portraits. Bookplate of Arthur Adelbert and Lillian Platt Stearns to front pastedown; joints and edges worn, with occasional board exposure; scattered soil and foxing throughout text, with tears affecting pp.99-104; Very Good. 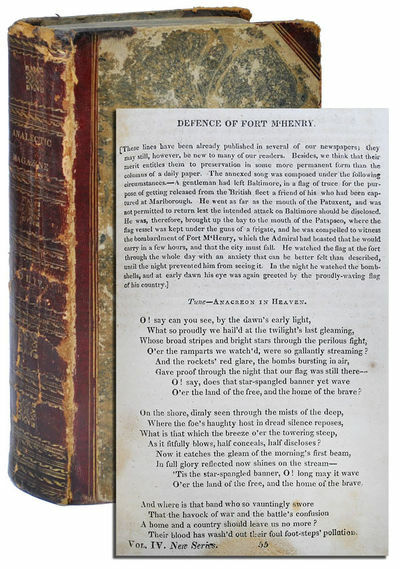 First magazine appearance of Key's poem, written in 1814 after witnessing the bombardment of Fort McHenry by ships from the Royal Navy in Baltimore Harbor during the Battle of Fort McHenry. The poem was set to the tune of a popular British song "To Anacreon in Heaven," written by John Stafford Smith. Set to Key's poem and re-named "The Star Spangled Banner," it would become a well-known American patriotic song, and was made the national anthem by congressional resolution on March 3, 1931. London: C. Cradock & W. Joy; Doig & Stirling, Edinburgh; and M. Keene, Dublin. 1814. 8vo., (2) + xxix + (3) + 984pp., including the half-title, slight old dampstain in lower margin of first few leaves, one leaf with marginal tear (no loss), one page with corner text not printed, bound in a handsome recent binding of tan morocco, raised bands, gilt lines and labels. With the bookplate on front free endpaper of the Royal Institution of Chartered Surveyors>. A good copy. Second printing. See Williams II, p.264. In fact this 1814 printing is a word-for-word reprint of the 1810 1st ed., reusing the 1810 title-page and half-title but adding a new title, dated 1814. This edition not in Goldsmiths. 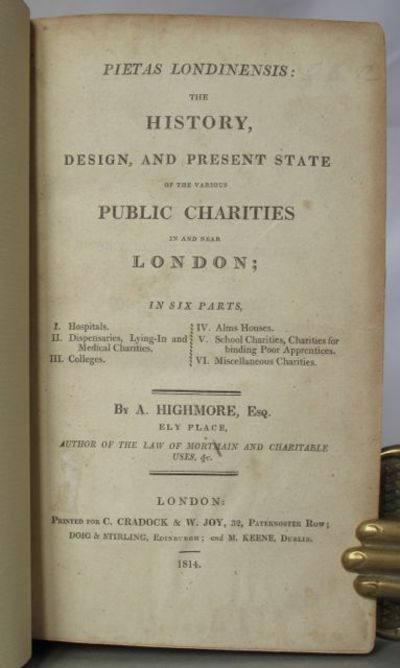 An extensive and comprehensive survey of charitable institutions in Regency London by Anthony Highmore (1758-1829). A lawyer by profession, Highmore was an intimate friend of Granville Sharp and had been actively opposed to the slave trade. 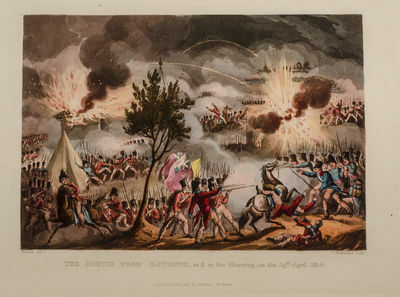 Always a Londoner, he joined the Honourable Artillery Company during the alarm when a French invasion was threatened and was secretary of the London Lying-In Hospital. In addition to a number of legal publications, Highmore published two valuable surveys of London philanthropy, the Pietas Londinensis> of 1810, and his Philanthropia Metropolitana> of 1822. They are both of considerable value to the modern student. Pietas Londinensis> puts London charities into six broad categories: hospitals; dispensaries, lying-in, and medical charities; colleges; alms-houses; school-charities and charities for binding poor apprentices; and miscellaneous charities. The number and range is enormous, and include the Asylum for Female Orphans in which Dr. Bell's education plan was introduced, Bethlehem Hospital, School for the Indigent Blind, Hetherington's charity, Bridewell Hospital, Society for Bettering the Condition of the Poor, Deaf and Dumb Asylum, Foundling Hospital, Joseph Lancaster's School, London Female Penitentiary, London Workhouse, Magdalen Hospital, Marine Society, Orphans' Working School, Refuge for the Destitute, and scores of others. There is a comprehensive index. London: Printed by Macdonald and Son, Cloth Fair, for Lackington, Allen, and Co., Finsbury Square,. 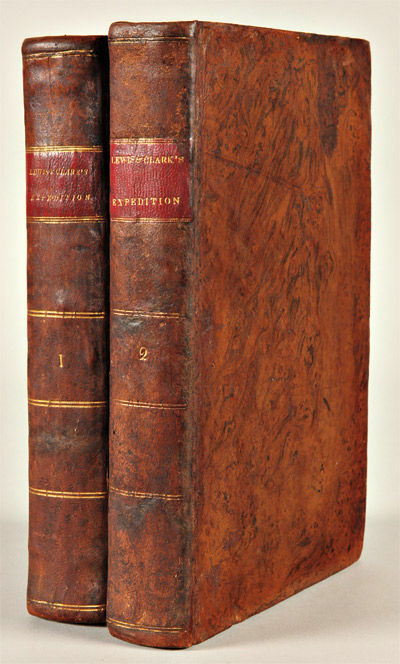 1814. rebound in a period nineteenth-century three-quarter brown leather and marbled boards, spine panel ruled and tooled in gold. red and green leather title and author pieces.. Frontispiece foxed with some offset on title page, some mild. scattered foxing in the text, a very good copy. Bound with a copy of. 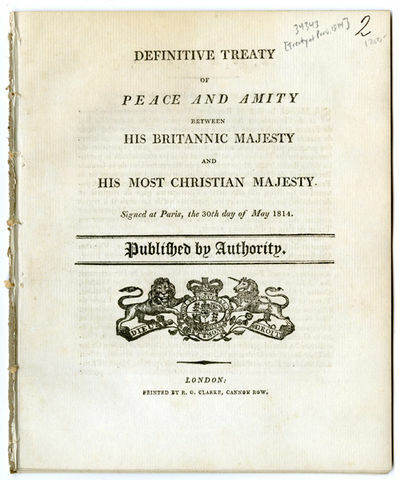 the enlarged (242 pages) 1815 second edition in an attractive modern. period binding. (#148267). First edition. A collection of credulous ghost stories based on UK legends and folklore, an early forerunner of similar compilations of "true" ghost stories by Catherine Crowe and Elliott O'Donnell. "When Horace Walpole used all the apparatus of Gothic fantasy in THE CASTLE OF OTRANTO (1765) he created a literary vehicle for ghosts without establishing the ghost story; the spectres were merely a stage effect. But they now became the stock-in- trade of the Gothic school of writing. In these novels a haunted edifice was an inevitable centerpiece. In most cases the hauntings were contrived by human agency or the ghost had a walk-on part in order to provoke the action; in much fewer cases were the ghost genuinely supernatural, with a more significant role. Most of these books were formulaic and repetitive, but a few are worthy of note... Although the better Gothics also utilized ghosts, these were usually rationalized. The use of sheeted spectres, wailing phantoms, rattling chains and gibbering skeletons reduced the supernatural element to burlesque, and the Gothic ghost story was soon parodied in such works as NIGHTMARE ABBEY (1818) by Thomas Love Peacock and NORTHANGER ABBEY (1818) by Jane Austen. Rudolph Ackermann published GHOST-STORIES; COLLECTED WITH A PARTICULAR VIEW TO COUNTERACT THE VULGAR BELIEF IN GHOSTS AND APPARITIONS... (1823) in an effort to counter the excesses of the Gothic story. In the UK the ghost story was as much influenced by folk tales and legend as by the Gothic romance. A number of Ghost Stories were collected in the same manner as the Grimm Brothers compiled their folk tales, and presented in narrative form. The main folklorists reporting these tales included James Hogg in WINTER EVENING TALES (1820) and THE SHEPHERD'S CALENDAR (1828), the brothers John and Michael Banim in REVELATIONS OF THE DEAD-ALIVE (1824) and T. Crofton Croker in FAIRY LEGENDS AND TRADITIONS OF THE SOUTH OF IRELAND (1825). Their stories take the form of reportage of folk legends, but became increasingly humanized. The best-remembered collector of ghost stories was Catherine Crowe, with her highly influential THE NIGHT SIDE OF NATURE (1848), LIGHT AND DARKNESS (1850) and GHOSTS AND FAMILY LEGENDS (1858). These set the trend for "real" ghost stories related in fictional narrative form, an approach that became very popular in the 1890s..." - Clute and Grant (eds), The Encyclopedia of Fantasy (1997), p. 403. Eaton Catalogue 3: 344. Not in Bleiler (1948; 1978) or Reginald (1979; 1992). 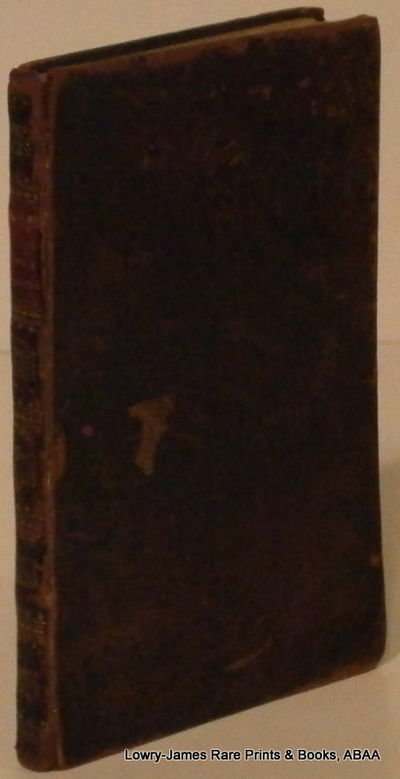 Block, The English Novel 1740-1850 (listing the 1815 enlarged second edition). Wolff 6671 (listing the 1815 edition). Kopp, Johann Heinrich, Arzt und Naturforscher (1777-1858). Hanau, 22. IV. 1814.. 1 S. Kl.-4to. Mit eh. Adresse (Faltbrief).. An die Barthsche Buchhandlung in Leipzig: "Ew. Wohlgeb. werden aus dem Schreiben des Herrn Polizeidirektors Schlenckh ersehen, daß derselbe Willens ist ein System der Polizei herauszugeben. Das Manuscript ist, soviel mir bekannt ist, mit Fleiß ausgearbeitet und Herr Polizeidirektor Schlenckh ein [...] wissenschaftlich gebildeter Mann. Sollte Ihnen nach näherer Prüfung des Manuscripts der Verlag conveniren, so würden Sie sich wohl bald in Hinsicht der Bedingungen vereinigen [...]". - Johann Heinrich Kopp wurde 1807 Professor der Chemie, Physik und Naturgeschichte am Athenaeum und 1813 zum Medzinalrat ernannt. "Seit 1814 Mitglied der medizinischen Deputation und Arzt im Hospital in der Altstadt, wurde er 1815 Hofrat, 1816 Garnisons-, Waisenhaus- und Stadtimpfarzt, 1824 Geheimer Obermedizinalrat und Leibarzt des Kurfürsten von Hessen. K. schrieb u. a. 'Über körperliche Verletzungen, insoweit sie das Verbrechen der Tötung bilden' (1812) und 'Ärztliche Bemerkungen, veranlaßt durch eine Reise in Deutschland und Frankreich im Frühjahr und Sommer 1825' (1825)" (DBE). - Mit kleinem Ausriß durch Siegelbruch. SEEFELD/Pilsensee. "Schloß Seefeld". Burgansicht mit wanderndem Paar im Vordergrund. - Kreidelithographie von Domenico Quaglio, 1814, 24,5 x 23 cm. Winkler 640,23; Lentner 10525: "Seltene Inkunabel der Lithographie". - Tadellos erhalten. "Schloß Seefeld". Burgansicht mit wanderndem Paar im Vordergrund.
. Kreidelithographie von Domenico Quaglio, 1814, 24,5 x 23 cm.. Winkler 640,23; Lentner 10525: "Seltene Inkunabel der Lithographie". - Tadellos erhalten. London: Thomas Lovewell & Co.. Near Fine/No Dust Jacket. 1814. First Edition. Hardcover. 8vo Complete work in two volumes; vol. I: pp. xii, 273; vol. II: pp.viii, 264. Half title present in both volumes. Tastefully bound in later half green straight-grained morocco, five raised bands with gilt lines, red and gilt spine labels, matching green boards, near fine. Contents clean and tight, wide margined copy, plain endpapers, volume I has a few water marks to bottom edge of the first few pages and again to a few pages towards the rear, but do not detract; volume II clean throughout, no inscriptions. A near fine tight set of the uncommon first edition. .
Elementos de hygiene: ou dictames theoreticos, e practicos para conservar a saude, e prolongar a vida. Publicados por ordem da Academia Real das Sciencias. from the "Serie Grabados de Español Ilustres". n.d. c.1789-1814]. - 36.2 x 25.4 cm, copper engraving. RARE. Portrait of Juan Sebastian del Cano, then Elcano [1486-1526], Ferdinand Magellan's navigator. After Magellan was killed in the Philippines he brought one of Magellan's ships, the Victoria, back to Sanlucar de Barrameda with 18 surviving men, arriving on Sept. 6, 1522, after a journey of 3 years and 1 month. Thus, Elcano rather than Magellan, has the distinction of being the world's first circumnavigator. Recueil des dessins d'ornaments d'architecture de la manufacture de Joseph Beunat. A Sarrebourg, et a Paris, Rue St. Avoye, no. 63. Contenant tout ce qui rapport a la decoration des apartments [.]. London: Printed for John Booth, 1814. FIRST EDITION n. Hardcover. 225 x 133 mm (8 7/8 x 5 1/4"). 1 p.l., lviii, 416 pp. FIRST EDITION. Pleasing contemporary midnight blue straight-grain morocco, covers framed by plain gilt rules outlining Greek key and palmette blind rolls, raised bands, compartments with central gilt fleuron radiating densely blind-tooled foliage, gilt-ruled turn-ins, all edges gilt; WITH AN EXCELLENT FORE-EDGE PAINTING OF DOVER CASTLE. A PRESENTATION COPY, with (slightly foxed) signed autograph letter bound in opposite title (with letter offsets): "The Author / begs Mr. E. S. Stephenson's / acceptance of this Volume / as a token of his / friendship and esteem. / R. S." Front pastedown with unidentified armorial bookplate. Full list of subscribers including addenda. A bit of wear to corners and joints, a very small (ink?) stain to edge of preliminary leaves visible at upper left background of fore-edge painting (not affecting primary image), otherwise a fine copy, clean and fresh internally in a lustrous binding. This is a decorative binding highlighted by an atmospheric fore-edge scene of Dover Castle painted by a skilled artist. The view depicts a cottage along a country road in the foreground, with Dover Castle looming in the background against a hazy sky; a small figure, presumably the cottage owner, stands right of center. The scene is well designed, with the eye moving from the cottage and castle towers at left toward the sea at the far right, the foreground landscape's more saturated color anchoring the composition. Of particular note is how this foregound, contrasted with the background's washed color, creates the illusion of perspective. Despite the (light) browns and greens at the bottom of the scene, the painting is essentially gray and particularly tranquil as a result. The skill of the painter here is seen most notably in his delicate and subtle shading, a challenge that defeats even very able practitioners of the fore-edge painting. As always, the dating of the painting is difficult, but we think that it was done much closer to the time of publication than to the present day. Our author, the Rev. Robert Stevens, was a celebrated speaker who ultimately rose to become the head of the chapter of canons at Rochester Cathedral. London. .. 39pp. with text in French and English on facing pages. Half title. Small quarto. Dbd. Minor foxing, half title detached but present. Very good. By this treaty the borders of France were returned to the status quo of 1792, including holdings in the Caribbean, so that France got back Tobago, St. Lucia, and Martinique, but had to return part of Santo Domingo. OCLC locates only three copies of this scarce printing. DAVENPORT 196. OCLC 38656503, 24454998. London: R. Ackermann, 1814. n. Hardcover. Some of "the Most Exquisite of all Flower PrintsIn their Beauty and Delicacy of Execution" 356 x 279 mm (14 x 11"). leaves of text. Recent retrospective quarter calf, flat spine divided into panels by gilt Greek key roll, green morocco label. WITH 49 ATTRACTIVE ENGRAVINGS OF FRUITS AND FLOWERS (including the frontispiece) by T. L. Busby, 25 OF THE PLATES STIPPLE-ENGRAVED, PRINTED IN COLORS by B. McQueen, AND FINISHED BY HAND (the other plates printed in outline or else in "flat" color). 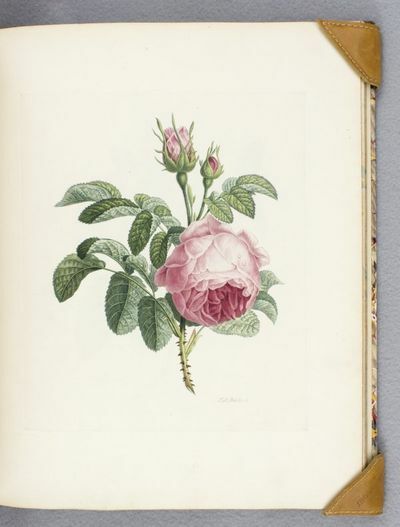 Dunthorne 320 and 321; Nissen 2067 and 2068; "Great Flower Books," pp. 147-48. Occasional mild thumbing, otherwise AN ESPECIALLY FINE COPY, clean and bright internally, with rich coloring, in an unworn binding. This is a beautiful copy of an exceptionally lovely botanical item based on Vincent's 1810 "Études de Fleurs et de Fruits," which Dunthorne says contains some of "the most exquisite of all flower prints in their beauty and delicacy of execution." The plates were engraved in reverse by T. R. Busby from the Lambert-Vincent illustrtions used in the French edition. Dunthorne says that his work is notable for containing "the only English stipple engravings printed in colour by a printer whose name is recorded." The work is putatively a manual for students, and there is some text here that describes the plates in such a way as to be helpful to the aspiring painter. But certainly for us now, the book is a collection of outstanding botanical images. Henriette Antoinette Vincent (1786-1830) was one of the group of painters, among them Redouté, Prevost, and Turpin, who at the turn of the 19th century brought France preeminence in the genre of botanical paintings. Like her fellow artists, Vincent had studied with the great flower painter of the Jardin des Plantes, Gerard van Spaendonck, and was later a pupil with Redouté, whose influence is unmistakable in the rose pictured in this work. The work is bibliographically confusing to begin with, and the present copy makes matters worse by atypically segregating all (but one) of the outline plates in the second part (after "The Elements" title page) and all of the fully colored plates in the first part. A work like this, enjoyed for its beauty and studied for its techniques, would usually be found in a dilapidated state, but the present item is remarkably clean and well preserved, with few signs of use. This is a very scarce work in any state: ABPC and American Exchange find just three copies at auction in the past 35 years, the last selling at Sotheby's London in 1987 for the equivalent of about $8,000. [Nasid tahani li-sa'adat al-kulli al-diyana Lwis al-tamin 'asar malik Faransa wa-Nawar]. Cantique de Felicitation a Sa Majeste Tres-Chretienne Louis le Desire, Roi de France et de Navarre, compose en arabe par Michel Sabbagh, et traduit en francais par Grangeret de Lagrange, eleve de l'Ecole speciale des langues orientales. Paris, Imprimerie Royale, 1814.. Large 4to. 23, (1) pp. Arabic text with French translation opposite. Contemp. blue marbled paper wrappers.. Rare congratulatory canticle to Louis XVIII of France, composed by Michel Sabbagh in Arabic and translated into French by Grangeret Lagrange, student of the Special School of Oriental Languages. One of the few works confirming the continuation of the production of texts in Arabic at the Imprimerie Royale, composed on the occasion of the First Restoration and the accession of Louis XVIII to the French throne. - Mihail ibn Niqula ibn Ibrahim al-Sabbag (1784-1816), whose name was francized into Michel Sabbagh, was of Palestinian origin. After completing his studies in Damascus, he moved to Cairo from amidst the Syrian Melkite community; during the Campaign of the Armee de l'Orient he was an interpreter for the French, and he followed them during the embarkation that followed the capitulation of Desaix. In Paris, Silvestre de Sacy involved Sabbagh with his work, in 1807 he officially became copyist for the Imperial Library, and also created a translation service of Arabic texts into the French language. - Binding rubbed; slight rustmark to half-title; very clean altogether. - OCLC 11873620. Cf. Fück 143 (for Sabbagh). Wien, Artaria, 1814-24.. Altkolorierte Umrissradierung von und nach A. Köpp von Felsenthal, Bildausschnitt 26,5 x 37,5 cm, Blattgr. 43 x 54,5 cm.. Nebehay-Wagner 309/65, Thieme-Becker XXIV, p 145; aus "Historisch mahlerische Darstellungen von Oesterreich", einer Serie prachtvoll kolorierter Umrissradierungen; malerische Ansicht des Lunzer Sees, im Vergleich zu Blättern des ersten Bandes mit deutlich farbenprächtigerem Himmel (Aufgrund eines Vulkanausbruchs 1815 waren die biedermeierlichen Sonnenuntergänge in Europa von nie dagewesener Pracht); etwas lichtrandig, sonst tadellos.